Backyards have become a true expansion of the home. 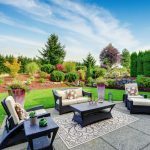 When properly landscaped and designed, your backyard will provide additional outdoor living space where you can spend time entertaining family and friends. Pergolas are architectural garden hardscapes that became popular during the Italian Renaissance. They can be a welcome reprieve from the midday summer sun while creating a lovely visual for your space. At its heart, the pergola is simple: crafted from sturdy boards and crossbeams, and accented with lattice and sometimes vines. With the right materials and guidance, they are a welcome addition to your garden retreat. Where you place your pergola is almost as important as the pergola design itself! Pergolas and similar hardscapes work great placed directly in the landscape or right next to your home. When located within the landscape, a pergola is visible from indoors, creating a beautiful scene. 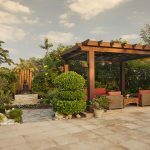 When deciding where to place your pergola, you should play to your landscape’s best features. Think about where you will be spending most of your time. What area of the landscape have the greatest views? Are there any spots that need to be sheltered from the wind? What time of day do you want to sit under your pergola? Which areas of the landscape are most pleasant at that time? How big a structure you want ? Minimum distance of 1-1.5 m is recommended from boundary lines to build a pergola. One of the most charming benefits of adding a pergola to your backyard design is the shade they offer to your backyard retreat. When building your pergola, you have the option to place smaller slats on top of the main beams, oriented in the opposite direction. These shorter slats are placed only two inches apart, offering exceptional shade cover to your outdoor space. Remember that a pergola is not designed to give you shade all day, as the sun will be moving. 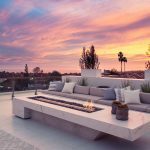 So consider your lifestyle and schedule when planning where to place any outdoor structures to make sure you design the best setting/space for the time of day you’re likely to spend time there. Curtains can be added to pergola for extra shade and sail shade fabric can bring shade too when combined with wood to create a cosy feeling. You can easily create boundaries within your backyard by adding a pergola. This covering can designate space dedicated to eating and entertaining, especially when built in combination with a patio and outdoor kitchen. Additionally, pergolas offer a covering for your outdoor furniture or outdoor dining area, amping up the functionality of your space. You can even add climbing plants, including flowering plants, ivy, and vines that will thrive with a pergola offering them support. You can even hang beautiful planters from the slats of your pergola to showcase additional plant life. A pergola is a perfect addition for those looking to enjoy a little shade with the bonus of a nice breeze. A pergola is a great addition to for your hot tub or plunge pool. A meranti wood pergola or aluminum pergola featuring louver panels that open for air or close for more privacy. If you don’t want to wait for the decorative vines to grow, you can add a thin shade cloth that will cut the UV by up to 65%. Not only are these pergolas decorative and functional, but they also create the feeling of a separate area for your backyard spa. As a home construction project, a pergola is far less intimidating than a covered patio. Whether your patio is directly outside your door or deep in your backyard, a pergola creates a separate space for entertaining and relaxing in the shade. Pergolas and patio covers let you spend time in your landscape even on the most sweltering of summer days. They are also great for defining spaces within the landscape and creating an inviting transition between indoors and out. Milestone Builds waterproof pergolas with wood and gypsum combination, wood covered by polycarbonate sheet, aluminum louvered pergola. Concrete structure can be combined with wooden roof to add character to the backyard. Choose your theme to decide what kind of pergola will suit you the best. If you are a homeowner working with Milestone to design a backyard retreat, you have countless options for customizing your space. Homeowners always have the choice to include a pergola in their backyard. These beautiful, wooden structures offer countless benefits, including dramatically improving the aesthetic appeal of your outdoor space.